This article is a contribution to ‘Liberalism and Occupy Wall Street,’ A TNR Symposium. “This occupation is for you.” The protestor with a trim grey beard smiled a bit as reporters and tourists snapped pictures of the small, handmade sign he was holding at the entrance to Zuccotti Park. His simple slogan—and the month-long occupation that inspired demonstrations in over 900 cities last weekend—may represent the beginning of a new chapter in the history of the left. Or the whirlwind of activism could end up sharing the fate of other protest campaigns since the 1960s, from anti-apartheid to global justice, leaving its organizers wondering how they let so splendid an opportunity slip away. 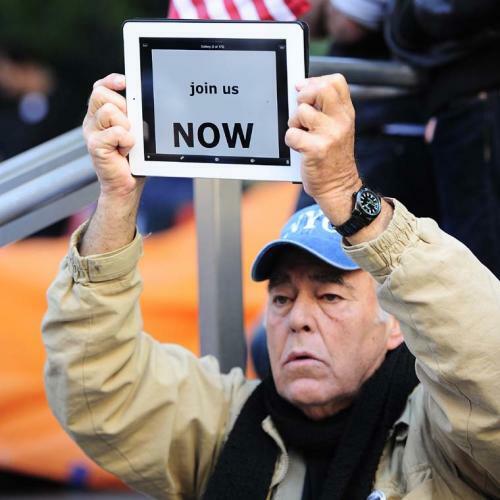 The greybeard’s slogan, a variant of the ubiquitous chant “We are the 99 percent!” makes an audacious claim: We may be just a few hundred people willing to camp out on a concrete slab a few blocks from Wall Street. But we are angry about how the economic elite and their neoliberal system caused a global economic crisis, and we have discovered a way to turn that anger into urgent and visible form. True, we have no set of alternative policies to offer—although we are studying up on and debating the possibilities as fast as we can. But we do know that the crisis has battered the jobs, wages, and benefits of millions of people all over the world. And, until the global economy is restructured in the interests of the battered majority, the very rich and extremely irresponsible will continue to have their way with us. This deeply moral and democratic message represents a leap beyond what most left-leaning activists, both in the U.S. and in Europe, have been saying since the 1960s. Gender equality, multiculturalism, opposition to military intervention, and global warming are all worthy causes. So was the sometimes disjointed attack on the World Bank and the IMF that briefly shut down Seattle in 1999. But each of these causes represented the passions of discrete groups whose opponents were able to belittle them as “special interests.” For all their virtues, each cause was either absorbed into the political culture (like feminism) or (like environmentalism and the movement against the invasion of Iraq) confronted powerful enemies able to wage a grossly unequal fight. But the occupiers have made the brilliant decision to appeal to anyone with a grievance of any kind against the visible corporate hands who helped bring us low and have suffered little or not at all for their actions. One result of this inclusiveness is a flood of new activists, some of whom have had no experience with the organized left before. In Las Vegas, one of the Occupiers I spoke with on an NPR talk-show is a small businesswoman who usually votes Republican but became incensed when no bank would give her a loan and no insurance company would provide affordable care to her employees. That such everyday concerns propelled her into the streets defies the image of scruffy young anarchists peddled by the right-wing media. There are also signs that the occupations, while small in themselves, are beginning to galvanize a much larger and broader, if still inchoate, movement. Polls show the Wall Street protests are supported by twice as many people as oppose them. Working America, the AFL-CIO’s outreach group to non-union wage-earners, signed up over 25,000 new members in the last week alone, according to its director Karen Nussbaum. And “Occupy” is becoming a handy term for local activists eager to gain a hearing for pressing local matters. Last Saturday, about a hundred people gathered at an Occupy the Bronx event that promoted green cooperatives and complained about the high cost of tuition at public colleges in the city’s poorest borough. Before too long, without either elected leaders or a semblance of a common program, radicals with tired but durable dogmas may imperil the young movement’s support among Americans who dislike ideologues of any persuasion. Already, the idea that corporate donations and Tim Geithner’s Wall Street background make the Democrats nothing but “servants to big business” slips too easily off the tongues of some of the Occupiers I have spoken with in New York City and Washington. They believe a President Romney, Perry, or Cain and a Republican Congress would simply mean that one set of malefactors had succeeded another. Kevin Zeese is a key organizer of one of the two separate, but quite amicable, occupations in Washington. In 2006, Zeese, who is in his mid-50s, ran for the U.S. Senate in Maryland as the candidate of three tiny parties—the Greens, the Libertarians, and the Populists. He received all of 1.5 percent of the vote. Despite that result, Zeese continues to argue that the new movement should start to assemble a third party of its own. So Occupy Wall Street has given American leftists a chance to appeal to millions of their fellow citizens who care about the same crisis they do and are open, at least for now, to egalitarian solutions. But the open-ended nature of the movement and, to paraphrase a greybearded activist named Marx, the incubus of failed ideas and strategies on the left still weighs on these vital and growing protests. What will the Occupiers do once the media frenzy has passed? Whether they will be remembered as the beginning of a newer, better, more inclusive left or a spirited remnant of an older, less attractive one depends on their answer.